State Supreme Court Judge Ray Price will soon become the Chief Justice, again. Price came to the Missouri Supreme Court in April of 1992, after serving in the private law firm of Lathrop Norquist in Kansas City, where he became a partner. Price is the longest serving judge on the court. 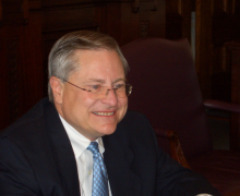 In fact, he has served as Chief Justice before, from July of 1999 through June of 2001. Price also is the last of the judges appointed to the Supreme Court by Governor Ashcroft. Some other Ashcroft appointees left the court for more lucrative positions. Price points out that Ashcroft a number of young people, giving them time to pursue other opportunities. Why does he stay when he could leave for more money? “I think public service is important. I gain a satisfaction out of serving as a judge that was important to me,” said Price. Price spoke on a wide range of interviews during the nearly one hour interview with reporters, including executions. He said he doesn’t plan to schedule any until legal issues are resolved by the 8 th Circuit of the United States Court of Appeals. The appellate court stopped the execution of Reginald Clemons last week after his defense team raised questions about Missouri’s use of lethal injection. Legal questions surrounding lethal injection halted executions in Missouri between October of 2005 and last month when the state put Dennis Skillicorn to death. Price officially becomes Chief Justice July 1 st , replacing Judge Laura Denvir Stith. He will serve as Chief Justice for two years.